I don’t care how tough you think you are or how much ‘street cred’ you think you have: you loved watching this geriatric foursome sit around on their rattan furniture, giving each other sass and friendship advice. 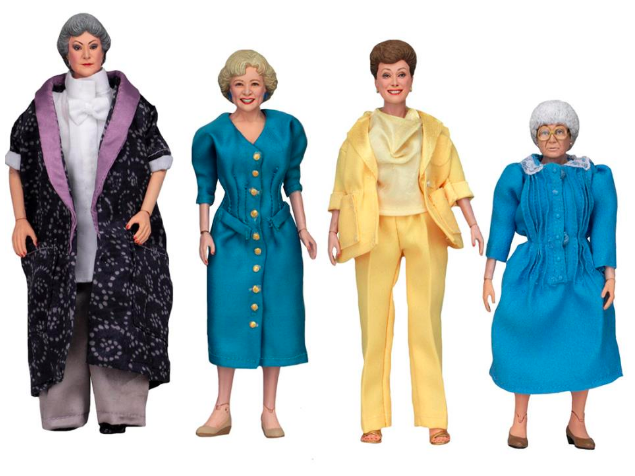 Well now you can re-enact your favorite Golden Girls moments with NECA’s Golden Girls 4 Action Figure Set! These 8″ licensed action figures are incredibly detailed and perfectly articulated, right down to their fashionable 1980’s conservative clothing. No word on if the Rose action figure is as intelligent as the other three. Thankfully, NECA opted not to go with the cast of the short lived Golden Palace bad idea. But don’t expect to get this classy ladies cheap! The set, complete in window box packaging, is going for over $114 on Big Bad Toy Store! Next Bathtub Cinema Is A Real Thing In Tokyo. Why Not Here?